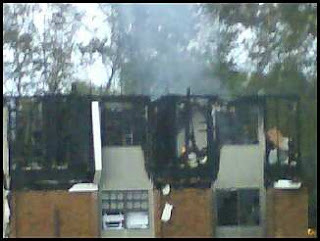 We had a fire in Winding River Village today. We're all fine; it wasn't in our building. It was the building next to ours. I was at work and received a frantic call from my wife to come home. 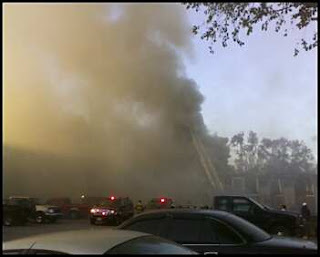 I rushed home and we spent the next three hours watching the efforts of the Sandy Springs FD. 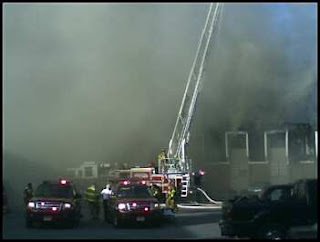 They did a great job and contained a fairly nasty fire to just one building. It was a very emotional experience for all of us. 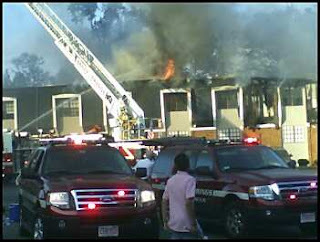 It wasn't our building, but it was still part of our home. 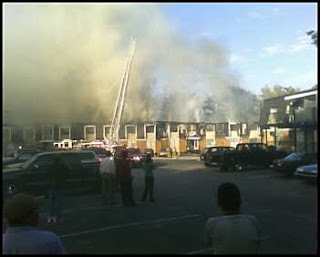 We all tried to pitch in; Steven actually went into the building before the fire spread and helped some others bang on doors and roust all the residents out. Darlene and the girls helped guide people out of the immediate area and I gave inspiration and hope just though my comforting presence. No, not really. I went back and forth between the parking lot and the rally point the condo board set up in the clubhouse and tried to keep everyone in our area of the parking lot informed about what was going on. 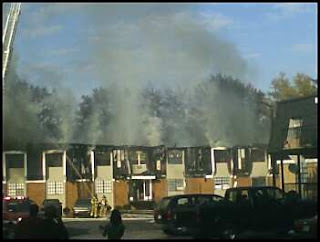 No people were hurt as far as I know. A couple of cats are still missing, but everyone else is present and accounted for. 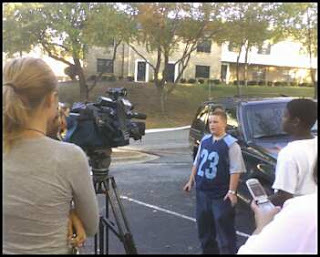 Steven got to talk to a couple of news crews, so he was feeling like the shizzle before he passed out asleep on the bed. We haven't seen him on TV yet, but if we do maybe I can get a video posted. I want my blog to be all multimedia and stuff like Rake's. Anyway, we tried to end the evening in a normal way with a little trick or treating and a trip to McDonald's (the McRib is back! Whoo!). Right now we're all exhausted--the kids are long since in bed, the wife is probably asleep on the couch, and I'm soon to bed after I get done with this post. For those with concern, we're fine. Shaken, stirred, and emotionally worn, but fine. We're all safe and we still have a home. That's what matters. 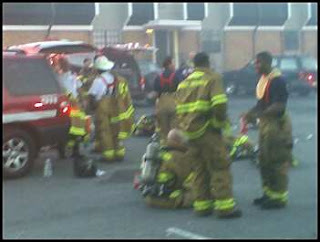 Here are some pics (taken with my camera phone) of the fire, the SSFD in action, and Steven the media hound. edited a few minutes later: We just saw a report on Channel 2. No sign of Steven's interview, but there was a quick shot of the twins in one of the crowd pans. Pretty cool, if it wasn't such a tragic situation. 12 families out of their homes. Trick or treat, indeed. Not the kind of trick I like. Well, here we are. It's almost November. A perfect time to review the resolutions I made at the beginning of the year. I was all aslather with fervor and hope and optimism. HA! I was going to write in my journal every week. HA! I haven't written anything but a pathetic little haiku since March. I was going to see my friends at least once a month. HA! I haven't seen Walter since that meeting in January that I was so effusive about in that other post. I've seen Ben and Wanda once since then, I think. I was going to lose 15 pounds. HA! I've gained five. As you can see, my resoluting skillz are not up to snuff. I should just learn to avoid setting any sort of goals. A wise philosopher once said, "I find my life is a lot easier the lower I keep everyone's expectations." Words to live by. I'm not going to promise to write more frequently. I'll try, but see what I just said about expectation. The less I promise, the less I have to uphold. I like it that way. I'll write when I think to, and I'll try to keep it fun. My fantasy football team is kicking major bootay this year. Sandy Springs FFC is 6-1 in the UFFL behind the efforts of my cousin Tom Brady, Plexiglas Burress, and Maurice Jones-Drew. I've made some prize money, and am leading the league in scoring. We'll see what happens this week. Finally, Steven is blogging again. You can find a link to his new blog over on the sidebar, or you can click here. Tell him Sam sent you. Thank you for coming by. Support your local bloggers. I'm out of things to say.